April 25, 2018, 9:25 AM · "Let's try doing this in time, a little more evenly," I said to my seven-year-old student as I removed the lid of the metronome and flipped the arm into motion. I started explaining what to do next: play the note on every other beat, with a beat of rest in between. Slightly complicated, but this little one was already a pretty adept musician, from a family of musicians, so I was pretty sure she'd understand. I took another breath to explain more, when I noticed that she was no longer listening. Ah, my big, old-fashioned mechanical metronome. I didn't realize that this fairly new student of mine had not seen it in motion yet. And apparently, she'd never seen a mechanical metronome, ever! "I didn't know it was some kind of a machine," she continued, wide eyes still fixed on the swinging arm, "a machine that - how does it work?" Okay change of plans, my little "play on the beat" lesson was not going to happen at this very moment, for sure! I explained to her that the metronome keeps an even beat. First you wind it up, then the weight on the arm of the metronome helps keep it in motion. I placed the weight low on the arm, to show her how fast it can tick. Then I placed it has high is it could go, to show her how slow it could beat. I even demonstrated my particular Wittner metronome's crazy bell, which gives a startling DING every set number of beats when you activate it. Of course, there's an app for all that, as well as countless varieties of electronic and battery-run metronomes that will fit right in your case. 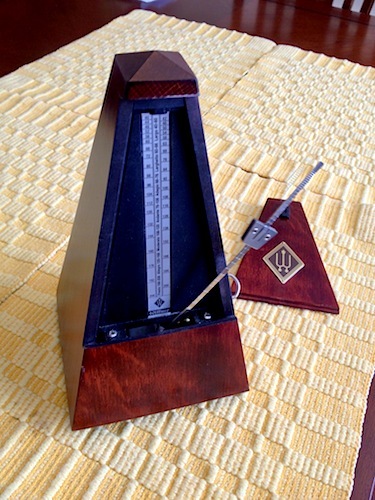 But for elegance of design, connection to history, and even dependability -- I'll take the big, old-fashioned metronome any day. When the batteries run out, the electricity goes off and the Internet goes down, that little wooden box will keep ticking! V.com weekend vote: Do you use a metronome that is mechanical, electronic, or an app? April 25, 2018 at 04:41 PM · Can you still purchase these today? April 25, 2018 at 05:29 PM · I have a plastic one of these, not wooden, but it looks similar. At work teaching middle school science we have a lesson on pendulums. The take-home of the lesson is that the period of the swing (ie how many beats per minute) is dependent on the pendulum's length and not on the weight or the starting angle (for small angles). The mechanical metronome illustrates that concept perfectly as you move the weight up and down to make it move slower and faster. April 25, 2018 at 05:54 PM · You certainly can, behold what I saw just a few months ago at the NAMM Show! 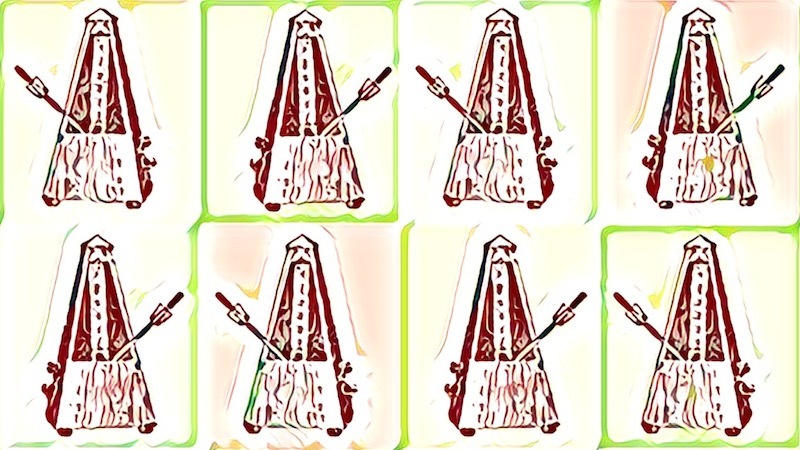 These are all Wittner metronomes. April 25, 2018 at 06:01 PM · Karen, so does that mean that the weight on the metronome basically "shortens" or "lengthens" the arm? I confess that I don't fully understand the nitty-gritty of the physics involved! April 25, 2018 at 07:41 PM · To be sure, I do have two other electric metronomes plus and app. But I use the mechanical one most often! April 25, 2018 at 09:35 PM · I am not even sure I would know how to operate a mechanical metronome. I have used electric ones since the very beginning. April 25, 2018 at 09:55 PM · I have a mechanical pendulum metronome* that has been in my family since early in the last century, and still works perfectly. The only thing you have to aware of with these things is to make sure it is on an absolutely level surface, otherwise you'll being hearing your young pupil playing to and copying an uneven rhythm! * The brass plate on its front says “Metronome de Maëlzel, Paris France, Londres, Bruxelles, Hollande, Amerique”. Its working range is from 40 – 208 in increments of powers of 2 from 2 to 16. April 25, 2018 at 11:34 PM · You're making me feel bad! I've had several Wittner wood metronomes over the years, but they've all been passed along to others. Oh well. April 26, 2018 at 12:43 PM · I found a Seth Thomas metronome at a local antique store, it's from the late 60's and in excellent condition. One of my true treasures! April 26, 2018 at 11:15 PM · Laurie, the arm of the metronome acts like a pendulum, as others have mentioned. For physical purposes, the length of the pendulum is the distance from the pivot to its centre of gravity, not the end of the arm itself. The pendulum of a clock places the weight at the very end to maximize its effective length. The weight on a metronome arm moves up and down so you you can adjust its effective length, hence the speed at which it swings. April 27, 2018 at 03:02 AM · I have a digital tuner/metronome. Tuner's fine; hate the metronome - way too quiet on maximum volume. My teacher (much younger than me) was surprised that my solution was to buy a Yamaha mechanical. Can hear that in another room! She thought it was pretty funny that was my solution and hadn't thought of it, but hey, whatever works. April 28, 2018 at 09:47 PM · But I don't think you can buy an automaton (Maëlzel's other well-known invention) these days! These days it can all be done by computer, yes, really by computer, not by a human being sitting inside. April 28, 2018 at 11:20 PM · I have one that is a Seth Thomas brand. I've had it since childhood, and my mother probably had it before then. It seems to be a bit uneven, though, so I use a phone app!